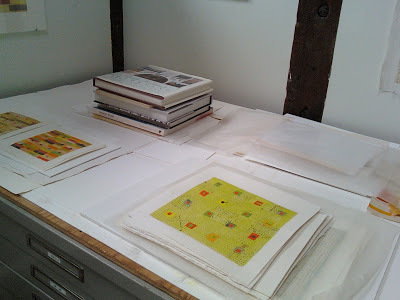 Images from a studio visit with Elizabeth Gourlay in August, 2009. 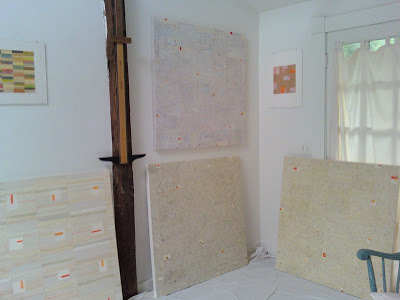 My quiet Connecticut neighbor, Elizabeth Gourlay, paints allegories. Her paintings speak of science as they document experiments with Cartesian planes and bar graphs. They speak of music as shapes represent sound and colors represent volume. They also speak of history and culture through overlapping layers of seemingly worn or tattered paper, unraveling threads of ancient textiles, and scattered symbolic imagery juxtaposed with timeless pattern. In case you aren’t familiar with Gourlay’s work, she has a BFA from Edinburgh College of Art in Scotland and an MFA from Yale. Her work has been exhibited throughout New York, Connecticut, California, Maryland, and Indiana, most notably at the Cummings Arts Center at Connecticut College, The Hecksher Museum, The Drawing Center, and the Widener Gallery at Trinity College. 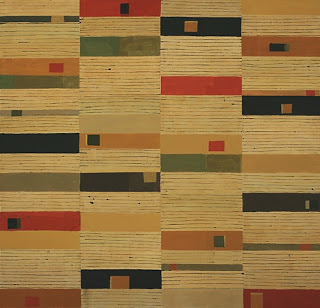 “Elizabeth Gourlay: Meridians,” eo art lab, Chester, CT. Through Nov. 1, 2009. I really love these – both the work and the shots of the work in the space are awesome! I'm really curious what they look/feel like up close. Many of the pieces are ink drawing and/or thinned painting on square (about 7×7") pieces of thin paper. 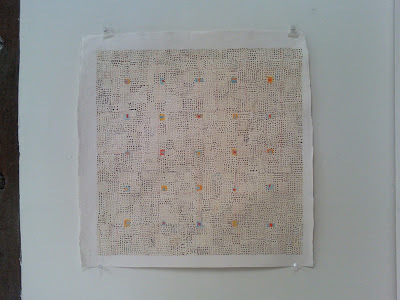 The pieces of paper are collaged onto painted linen canvas. Delicate surfaces, hand-drawn lines and marks, blotted and imperfect.